Jesus fulfilled over 300 prophecies through his birth, life and death. Jesus – and later his disciples – often used the evidence of fulfilled prophecy to prove that He was the Messiah. This is an advent activity designed to introduce children to Old Testament prophecies that were fulfilled through Jesus’ birth. Each day, you will learn a new Old Testament prophecy that Jesus fulfilled, and you will learn just how difficult it is to fulfil prophecy on your own! It’s simple to make and do. By Christmas day your children will know that Jesus’ birth was no mere accident or simple undertaking. It involved God in every step. NB: There are more prophecies that I could have covered, but since the Christmas season is busy and sometimes we have to skip a night of our advent calendar, I’ve purposefully made this advent activity shorter than the traditional 25 days. You’ll need 18 colourful cards – old Christmas cards, coloured paper, or paint swatch cards (shown below) in various colours. First, write the numbers 1 – 18 on the non-coloured side of each card (if applicable), one number per card. Next, write or type out the corresponding scriptures for each day on each card (see below). Leave a blank space at the bottom to write down the key lesson (see photos below). 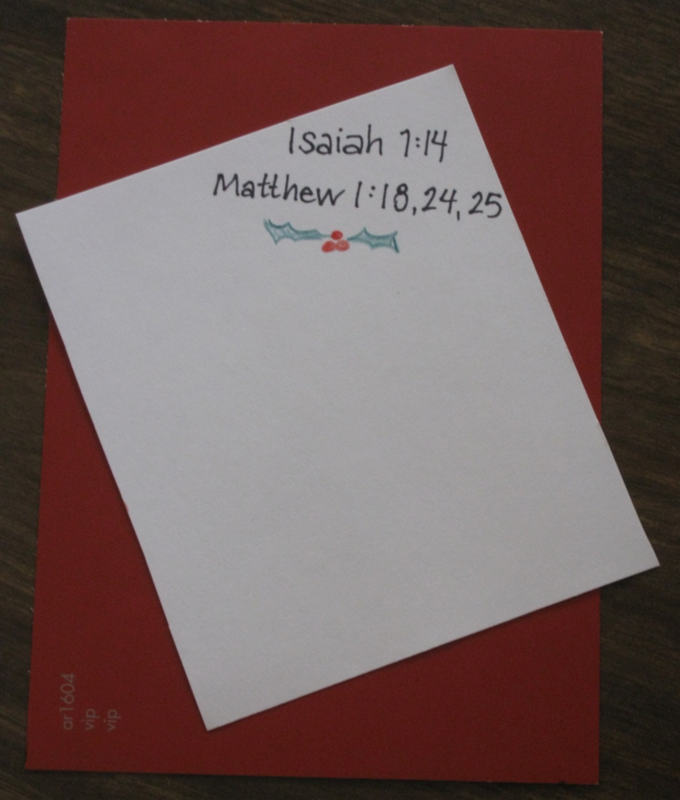 For days when no scripture is presented, leave a blank space on the back side of the card to write down the key lesson. Arrange your cards however you wish. You can place them into the form of a tree, like the picture at the top of this page. You can pin them to a corkboard, tape them to the wall, or find some other way of displaying them. Whose birthday do we celebrate on Christmas Day? Jesus! Jesus is God’s answer to sin and the separation of man from Himself. Did you know that Jesus’ birth and death are so important to God’s plan for us, that He talks about them in over 300 places in the Old Testament? In fact, Jesus’ birth and death are the main story that runs throughout the entire Bible. As we look forward to Christmas Day, we’re going to look at all the prophecies that foretold Jesus birth. What is a prophecy? It is a prediction of what will happen in the future. God used prophets to warn and tell the people of Israel about important things that would happen in the future (prophecies). Since we’re anticipating Christmas, we’re going to look at the prophecies about Jesus’ birth. We’re going to discover the prophecies that were written more than 450 years before Jesus was born and see what they predict about how and under what circumstances Jesus would be born. 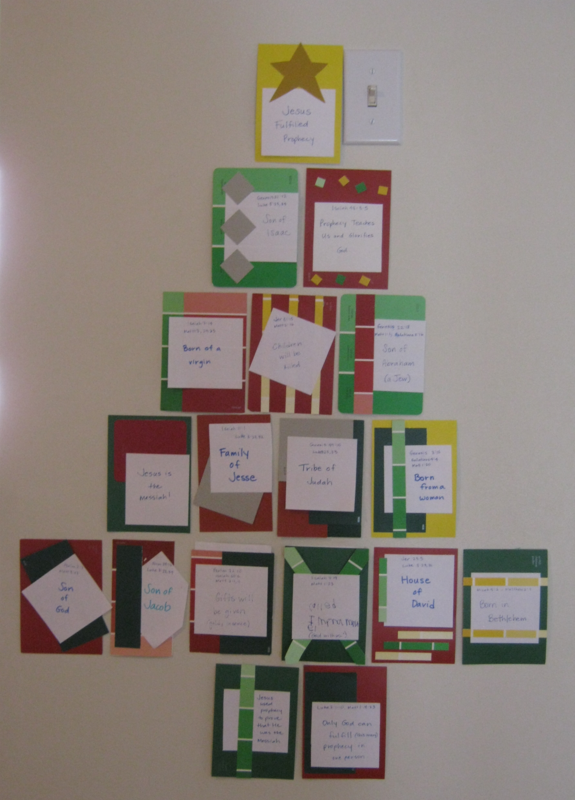 Flip over the card for Day 3 and read the passages: Genesis 3:15; Galatians 4:4; Matthew 1:20. We learn that the Messiah wasn’t going to appear about of nowhere, he was going to be born as a baby. Write down the key lesson: Born of a woman. Flip over the card for Day 4 and read the passages: Isaiah 7:14; Matthew 1:18, 24, 25. The Holy Spirit put the Messiah into Mary’s womb. Jesus was not born exactly the same way as the rest of us. Write down the key lesson: Born of a virgin. Flip over the card for Day 5 and read the passages: Psalm 2:7; Matthew 3:17. Most children are the sons or daughters of their human parents, but Jesus is the Son of God. Write down the key lesson: Son of God. Flip over the card for Day 6 and read the passages: Genesis 22:18; Matthew 1:1; Galatians 3:16. God told us that the Messiah would be of Jewish descendant. The Jews trace their heritage back to Abraham, the father of their nation. Write down the key lesson: Son of Abraham. 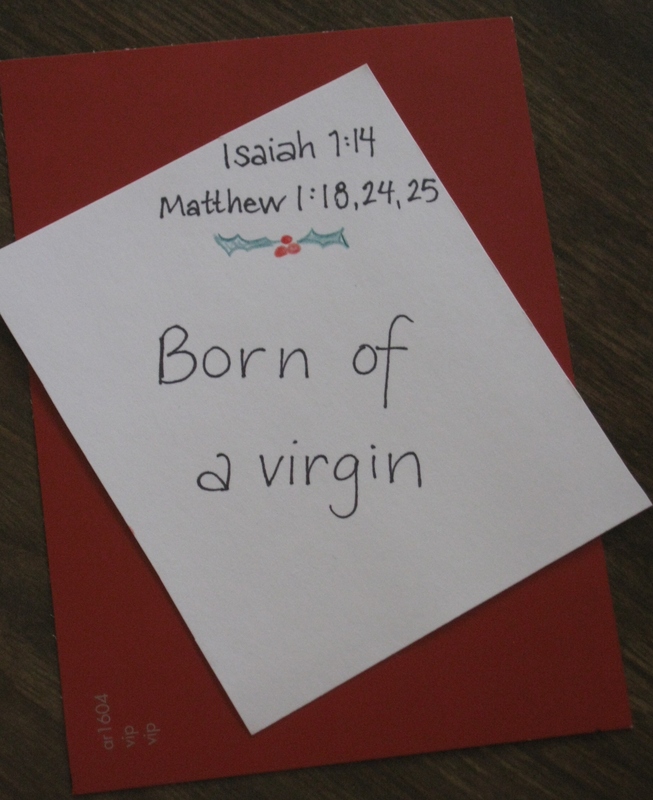 Flip over the card for Day 7 and read the passages: Genesis 21:12; Luke 3:23,34. Abraham had two sons: Isaac and Ishmael. Now God eliminates one half of the lineage of Isaac. The Messiah would be a direct ancestor of Isaac. Write down the key lesson: Son of Isaac. Flip over the card for Day 8 and read the passages: Numbers 24:17; Luke 3:23,34. Isaac had two sons, Jacob and Esau. Now God eliminates one half of the lineage of Isaac. The Messiah would be from Jacob’s family. Write down the key lesson: Son of Jacob. Flip over the card for Day 9 and read the passages: Genesis 49:10; Luke 3:23,33. Jacob had twelve sons and each became a tribe of the Hebrew nation. Now God eliminates eleven-twelfths of the lineage of Jacob. The Messiah would be from the tribe of Judah. Write down the key lesson: Tribe of Judah. Flip over the card for Day 11 and read the passages: Jeremiah 23:5; Luke 3:23,31. Jesse had at least eight sons (I Samuel 16:10,11). Now God eliminates all of Jesse’s sons except one, David. The Messiah would be from David’s family, or ‘house’. Write down the key lesson: House of David. Flip over the card for Day 12 and read the passages: Micah 5:2; Matthew 2:1. Now God eliminates all the cities in the world except one, Bethlehem, as the birthplace of the Messiah. Write down the key lesson: Born in Bethlehem. Flip over the card for Day 13 and read the passages: Psalm 72:10; Isaiah 60:6; Matthew 2:1,11. God predicted in advance that the wise men would know about the birth of the Messiah, and gave them the idea of presenting Him with gifts. Write down the key lesson: Presented with gifts. Flip over the card for Day 14 and read the passages: Jeremiah 31:15; Matthew 2:16. God predicted the reaction that Herod would have to the Messiah’s birth. Herod’s jealousy resulted in a terrible tragedy – he killed all the new born boys in an attempt to kill the Messiah who would become ‘King of the Jews’. Write down the key lesson: Children would be killed. Flip over the card for Day 15 and read the passages: Isaiah 7:14; Matthew 1:23. Jesus was God with us, God come in to the world to die for our sins and make a way for us to have a relationship with Him again. Write down the key lesson: Called Immanuel (‘God with us’). Day 16 – Can You Predict the Future? Before you flip over today’s card ask: Can you tell me the name of the hockey player – including the team he plays for – who will score the winning goal of the Stanley Cup in the year 2515 (i.e. : in 500 years from today)? How hard would it be to get the answer to that question right? Did you know that it would be way, way harder for a person to fulfill all of the prophecies that were given about Jesus’ birth than to predict which player would win the Stanley Cup in 2515? (See this article http://www.askapastor.org/proph.html for a graphic illustration of the probability of one man fulfilling these prophecies by chance). What if before Jesus was born, He decided that He wanted to be the Messiah. Could He have planned where He was born, the time He was born and how He was born? No, many of the prophecies about Jesus were not ones He could control. Only God could have arranged for these prophecies to have been fulfilled in Jesus. Flip over the card for today and write down the key lesson: Only God can fulfill this many prophecies in one person. Many times during His life on earth Jesus explained to His disciples (and others) how His life was a fulfillment of Biblical prophecy. This was one of the ways He proved that He was the Messiah to the people of His day. Flip over the card for today and read in the scriptures where Jesus tells his disciples that He fulfills Old Testament Messianic prophecy: Matt 5:17; Luke 24:27; Luke 24:44; Matt 26:56; Luke 22:37. You can also read how His disciples do the same when they tell others about Jesus: Acts 3:18; Acts 10:43; Acts 13:29; Acts 17: 2, 3; 1 Cor 15:3-4; Rom 1:2. Flip over the card for today and write down the key lesson: Jesus uses prophecy to prove He is the Messiah. Flip over the card for Day 18 and read the Christmas account from Luke 2:1-10 and Matt 1: 18-23. Have your children listen for each time the gospels say ‘this happened in order to fulfil was what written by the prophet…’ (or something similar). Thank God for leaving His fingerprints all over Jesus’ birth by telling us in advance what to look for . Write down the key lesson: Jesus is the Messiah! I am indebted to Dave Arch (http://www.askapastor.org/proph.html) for this material. He references Josh McDowell’s Evidence That Demands a Verdict as his main source, which I have also used in the preparation of this material. Hi Harry,I am looking at this activity for next weeks GNC.I wanted you to look it over and let me know if it is appropriate.The following week,I thought we could keep the board up with the prophecies and as you tell the Christmas story,the children will see how each prophecy was fulfilled.That means we will be looking at the prophecy but I will not be going into how it was fulfilled.Is that going to be confusing to them ? Thoughts ? It probably depends on the age of the kids you are teaching. If they are very young, it would need to be spelled out for them. Older kids might be able to make the links. If you go ahead with this plan, I’d remind kids about the prophecies and have them listen for the fulfillment (by raising a hand when they hear it). I’d suggest limiting the number you use though, so its easier (especially if they are young). Older kids would not need limiting. Hope it goes well!